One of the most important considerations in managing your small business is physically having a small business in the first place. Even with the greatest ideas, the most hardworking staff and backed by ample financial resources, your company will not be much without an office. Renting an office space should be one of your top priorities at the onset of starting your business. However, it takes more than simply looking up available lots around town and choosing one at random. Here are some tips on the right way to rent out small business space. The commitment that comes with a longer lease, such as one that spans five or ten years, could seem intimidating at first. However, there are many benefits that come with a longer-term rental agreement, namely the flexibility of locking in today’s cheaper rent for a longer period of time, according to Bankrate. Additionally, the idea of a longer lease in the back of your mind gives you the confidence to keep growing your small business. The 10-year lease acts as a subtle motivator, pushing you to get to that mark and extend the lease beyond it. Of course, this comes with the caveat that your company can afford the extra space. However, similarly to the aforementioned reason for signing a longer lease, Entrepreneur Magazine notes that having extra office space motivates you and your business to continue pursuing growth. A higher ceiling – literally – can lead to hiring more staff just to fill the space. Many businesses find themselves held back because they physically don’t have the space to grow. Save yourself this headache down the line by getting more space than you actually need right now. There are many little considerations that should be thought of when selecting an office space. For instance, a high number of windows leads to more fresh air and quality light coming in, which naturally leads to increased productivity. Additionally, for a small business, there’s usually a right side of the street and a wrong side. One side will be better received, welcome more foot traffic and ultimately translate to more customers. Do some research to figure out the best side to rent on. 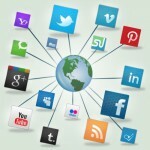 Here are some social media trends for 2013 to keep an eye out for.